Do Your Tax Online With Us- HBS Financial Group, Ltd.
(GAL) – If there’s one thing that you can count on, it’s the annual changes to tax online filing. A major change for 2018 tax returns is the new Tax Reform Act. Many of you who were able to itemize your deductions in prior years will probably be able to do your tax online with the increased standard deduction. There are many other changes that have to do with personal exemptions, child and other tax credits. If you aren’t up to speed on those, it will probably be a good idea to take advantage of our low-cost program, and file your taxes online. Our easy-to-use program uses the interview method to get your information, and then it knows exactly the type of return to use, plus it will get all of the tax credits that you are eligible for. You’ll also find other changes that you may not be familiar with, but rest assured, our program is right on top of it. Another change you’ll see on the internet is the creative advertising done by the major players. Most of their internet offerings emphasize free tax filing, when in fact, only certain taxpayers will qualify for it. They generally have higher prices for their tax online filings. They often try to justify that by making you think that they are doing you a favor at that “low” price. To entice you to click on their ad, they use the word free over and over again. Their goal is to get you into the program and hope that you didn’t bother to read the fine print buried at the bottom of the page. As you start the program, the word free quickly disappears when you see that you didn’t qualify for the free federal return. Yes, only the federal return is free and you will pay to file your state return. 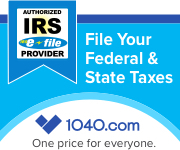 All of the software vendors, including ours at 1040.com, offer free filing of the federal return. There are different gross income amounts that qualify. At our site, if your gross income is below 100,000.00, and other IRS mandated conditions are met, the federal return is free. We have a low fee to file your state return, and it is clearly specified on the page. Our innovative software program will ask you a few simple interview style questions and from your answers, will present you the required forms for you to complete. You enter that data from the forms that you received, and our program will review everything. It will determine all deductions and tax credits that you qualify for, and will enter them into your return. During the review, the program determines the type of tax return that you need to file, and does this automatically. For 2018 tax returns, there is no longer a Form 1040A or 1040EZ. They have all been consolidated into a shortened Form 1040 that has 6 attached schedules. Not all filers will use all of them, and it may be a bit confusing. This is another reason to do your tax online with us. We know what you need based on your filing status and other tax information that you have. Once you review your completed return to be sure that you entered all of the data correctly, you’re ready to e-file. We offer free e-filing to the IRS for all returns and also to your resident state. If you need to file returns to several states because you earned income there, we file those for you as well. We can file returns in any state that you have income and are required to file. We also will maintain your basic information for next year in a highly secure database at no charge. Due to higher earnings or perhaps itemizing deductions, many taxpayers will need some of the other schedules. No need to be concerned though, we will handle all of the heavy lifting for you. If you have a side hustle or a rental property, don’t worry, we have you covered. Once you enter your data for these other forms, the intuitive program completes all of the forms and schedules and calculates your return accurately. It’s really amazing just how fast it does this, and we give you a 100% accuracy guarantee. All of this is done at the low fee quoted to you as you do the review. At this point, you aren’t under any obligation to pay and finish your tax online filing. Should you need any help throughout this process, an e-mail to us will get you going again quickly. Naturally, this is free as well. You really owe it to yourself to try our amazing software. You will be able to complete your tax return right up to the point of e-filing. If for any reason, you don’t want to file, you can stop right there with no obligation. We appreciate your interest in our firm and would love to have you as a client. Anything that we can do to earn your business will be done. Click on this link and do your tax online with us. Did we mention that you can try it free of charge? I already checked my filing for 2018, and it looks like the new standard deduction will be a lot higher that if I itemized. The IRS should have done this years ago, and it would have saved a lot of time keeping all of those tax records and such. Thanks for stopping by Anna. Be sure to check your state return also. Many states won’t let you itemize unless you itemize on the federal. Your program really looks easy to use. I did a test return and you’re right, after answering the interview questions, all of the forms were ready for me to enter the tax info. Plus, the new tax act with the increased deduction should make it a breeze to complete. We do have a very user-friendly program Megan. Thanks for trying it. Last year my wife and I used Turbo Tax and the program itself was pretty easy to use. However, we have a side hustle and had to file a schedule C, and that sure increased our cost to file our return. I don’t see those high charges with your site so this looks like we’ll be back in February. Hi Russell. Thanks for your comment and look forward to your return. I did a test return with you guys and compared your price with the other three and my type of return is a lot cheaper with you. All of these online tax return programs pretty much use the same procedure in getting the tax information, so for me, it comes down to the cost. I’ll be back to see what the fees will be with this new tax law that went into effect. Hi Sarah. Thanks for your comment and please come back to check us out.